An explosion far beneath Manhattan’s surface turns prosecutor Alexandra Cooper’s ninth case (Death Dance, 2006, etc.) into a free-for-all with roots sunk deep in the bedrock of the past. Did Brendan Quillian strangle his wealthy wife, Amanda, who’d been making serious noises about leaving him, so that he could keep her money and his management job with her late father’s real-estate empire? Lemuel Howell III, Brendan’s silky attorney, insists that his client will be vindicated, and his cross-examination of Alex’s first few witnesses certainly seems to justify his confidence. But the case is rocked by a blast in Water Tunnel #3, a construction project 60 stories underground designed to bring water to an increasingly thirsty New York—a blast that kills Brendan’s brother Duke, a sandhog who worked there. Alex, who had never given Brendan’s family of working-class Irish immigrants a second thought, is suddenly wrapped up in their dirty laundry. There’s news from Brendan’s sister Trish of a long-simmering feud between the Quillians and the Hassetts, who toiled alongside them in Tunnel #3. There’s the revelation that 20 years ago, Bex Hassett, Trisha’s best friend, was strangled in Pelham Bay Park during Brendan and Amanda’s honeymoon. And a macabre new detail has surfaced: Somebody cut off Duke’s finger before the explosion finished him. Before Alex can fit Amanda’s murder into this decades-long pattern of violence and hatred, a courtroom surprise sends the case hurtling off in still another direction, and the only certainty is that it’ll end deep in the bowels of New York’s tunnel system. 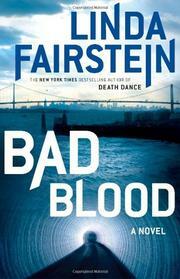 Fairstein’s latest is as generously plotted as ever, with a series of fascinatingly grim locales that suit her gifts perfectly—even if she can’t resist whispering historical sidelights into your ear with every change of scene.